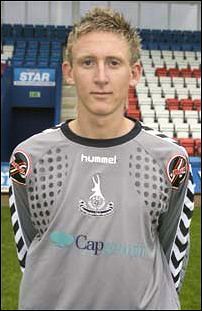 Mark Yates signed his first new player yesterday when he bought in rookie keeper Steve Taylor from AFC Telford on a one year contract. Taylor, who has only ever made four appearances for his old club, and before that at Market Drayton, over a year ago, spent last season playing cricket in Australia and can only be seen as a stop gap keeper until a real one is bought in. He may have potential but he has hardly ever competed in a serious game and also has no experience of football at this level. This, along with his obvious lack of match fitness has to be called into question and one can only hope that Mark Yates knows what he is doing or intends to do. In his time at Telford he only managed to get any games when the former Harriers goalie, Stuart Brock, broke a leg at the tail end of the season and, after failing to keep that first team place the following season, decided to pursue a cricketing career down under. If Yates had decided to keep him as a second string to either John Danby or Daniel Lewis, both now departed, it would have made sense but I am here to be proved wrong.